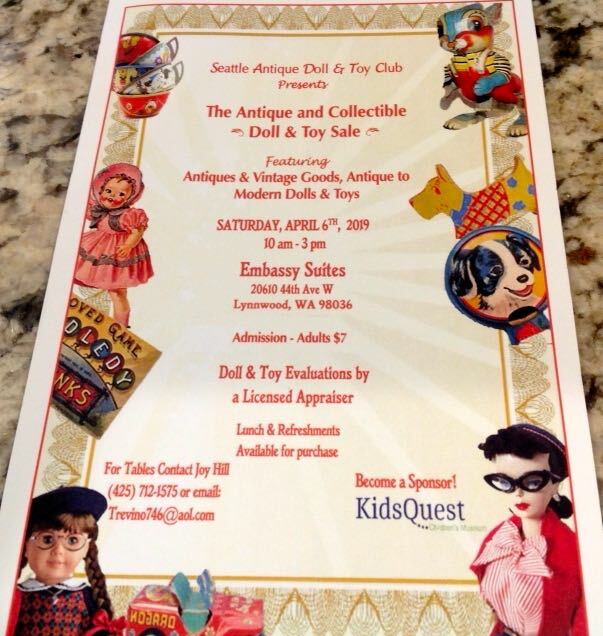 The Seattle Antique and Collectible Doll and Toy Club will hold their 25th annual fundraising event on Saturday, April 6, 2019 from 10am - 3pm at Embassy Suites 20610 44th Ave W, Lynnwood 98036. This is a fabulous treasure hunt, complete with a "Antiques Roadshow" appraiser to evaluate one of your Crown Jewels. (A $5 per item charge all going to charity). Vendors include Vintage Barbie (renown dealer Judy Roberts) and French Fashion Antique Doll (Carmel Doll Shop). Modern-Antique. American Girl, Ideal, American Character, Revlon, Miniatures, bears, vintage toys, vintage fabric, jewelry, artists, antiques and so much more. Free parking, and an excellent restaurant on site.